“Practical achievement of the target of a world free of cluster munitions demands great dedication, concerted vision and collective initiatives and responses,” stated Ambassador A.L.A. 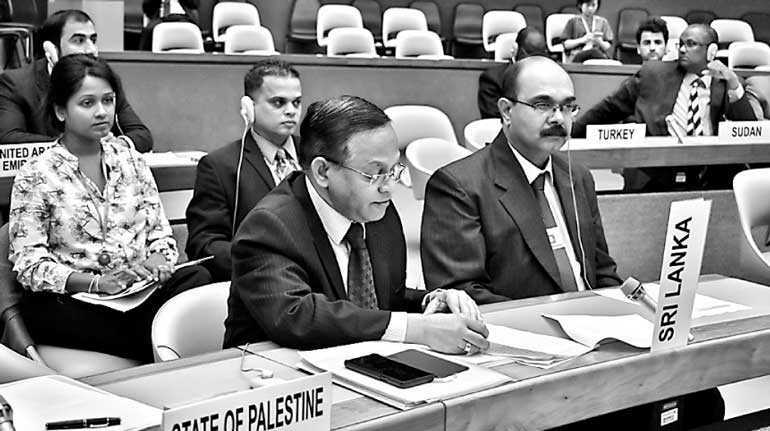 Azeez, Permanent Representative of Sri Lanka to UNO in Geneva, at the closing session of the 8th Meeting of the State Parties to the Convention on Cluster Munitions in Geneva recently, in acceptance of the Presidency of the 9th Meeting of the States Parties (9 MSP-2019). During the three-day meeting that commenced on 3 September, Sri Lanka was specially commended for joining this key humanitarian disarmament Convention aimed at banning production, storage, transfer and use of cluster munitions. Sri Lanka acceded to the Convention on 1 March, as the 103rd State Party. Ambassador Azeez was elected the President of the 9th Meeting of State Parties, in a year that marks the 10th Anniversary of the adoption of the Convention. The year of Sri Lanka’s leadership is an important transitioning point, building momentum for the Second Review Conference to the Convention to be held in 2020. The presidency of Sri Lanka will run through till September 2019, involving an intensive process of advocacy, consultation, coordination and strategic direction, on a multi-stakeholder platform, consisting of civil society and defence establishments in the promotion of the objectives and norms of the Convention. Highlighting the policy initiatives taken by the Government of Sri Lanka since 2015 in the humanitarian disarmament arena, Ambassador Azeez emphasised that accession to the Ottawa Convention on Anti-personal Landmines further strengthened the positive image of Sri Lanka worldwide, as a country balancing civilian needs and national security imperatives. The Sri Lanka delegation included Major General Kumara Peiris, Chief Field Engineer, Samantha Jayasuriya, Deputy Permanent Representative and Shashika Somaratne, Minister Counsellor. Sri Lankan Civil Society was represented by Vidya Abeygunawardena, Coordinator, and Yanitra Kumaraguru, Campaigner for Sri Lanka Campaign to Ban Landmines.